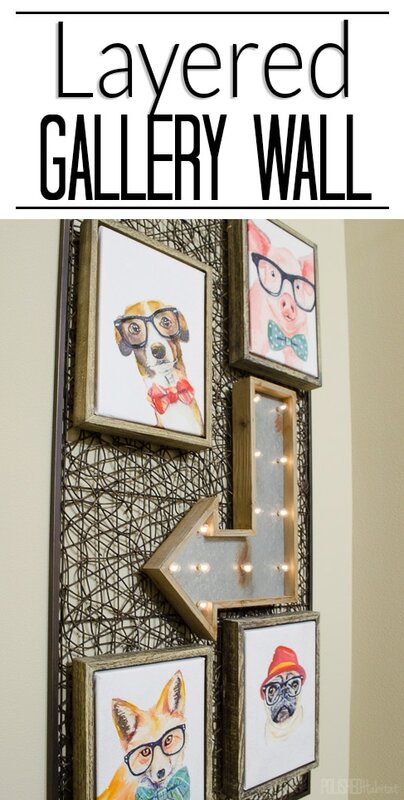 I have to laugh when I see gallery walls listed as a “trend” because there are infinite ways to pull them together. They existed long before magazines and bloggers started talking about them, and I don’t see them disappearing any time soon. They serve too much function, from letting us display smaller pieces we love to camouflaging TVs. That said, I would agree you probably don’t want to use the same style gallery in every room of your house. 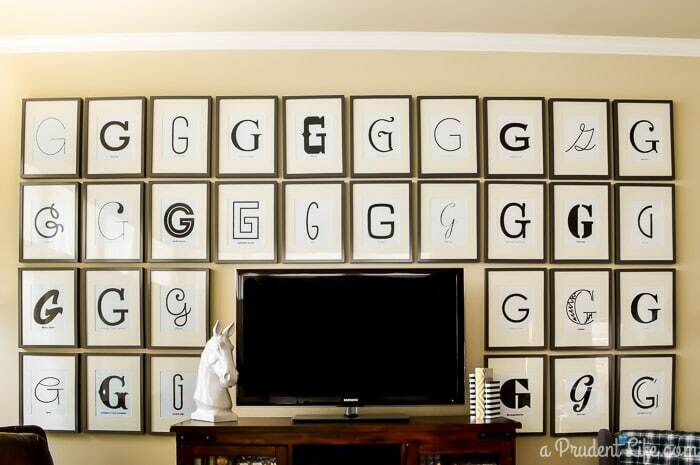 In our living room, I went VERY symmetrical with our wall of G’s. Then in the office we combined posters with records to fill the wall around my husband’s computer. 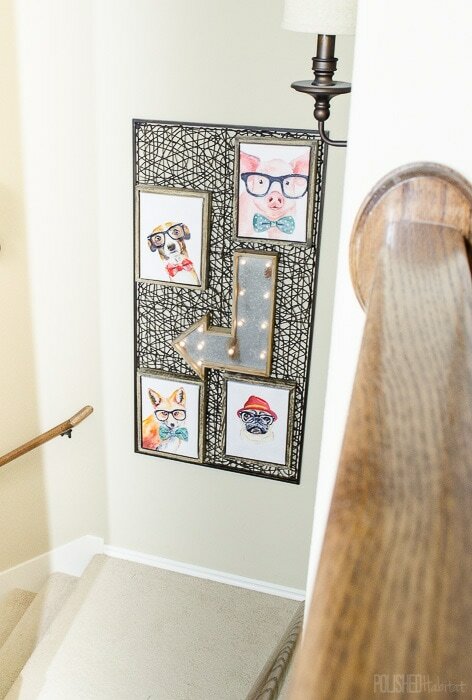 So, when Pier 1 challenged me to create a gallery wall with their art, I wanted to do something different! Stay tuned because they are also providing a $150 gift card for one of you. Enter at the end of the post! It was kind of crazy to take this on the middle of the master bedroom makeover, but you know I can’t turn down a challenge! Especially when we had a sad, naked, stairwell in need of some art. Here’s what it looked like before. It was SO boring! To spruce it up, I started with a jumbo 30″ x 60″ metal & rattan piece. 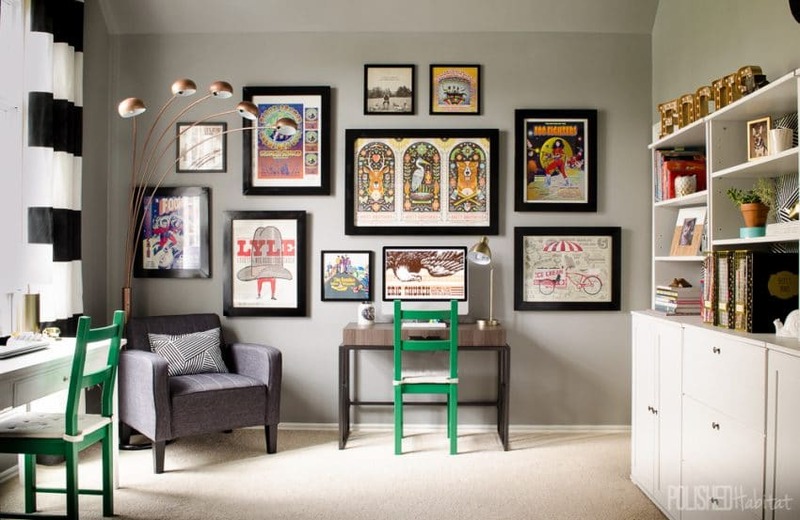 The key to this layering method is to select a large background item the size of the space you want to fill. 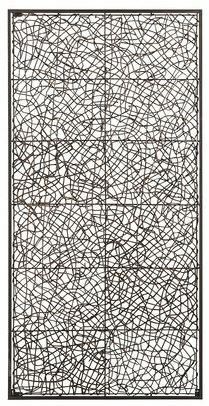 I love all the movement in this particular piece, but using a solid piece of wood or metal would also be very cool! With the background selected, I picked out a mixture of art and wall decor that made me smile. 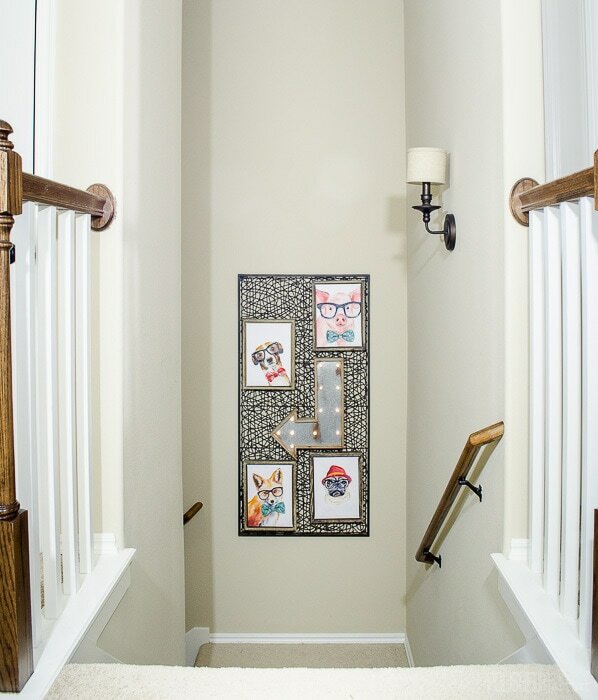 Something about a stairwell makes me think the art should be fun and poppy, but this layering idea would work with all different styles. When I saw the light up arrow, I knew it was perfect for the stairs! We attached the arrow to the big art using wire. Just make sure that you are wiring to the metal cross braces if you use this exact background. 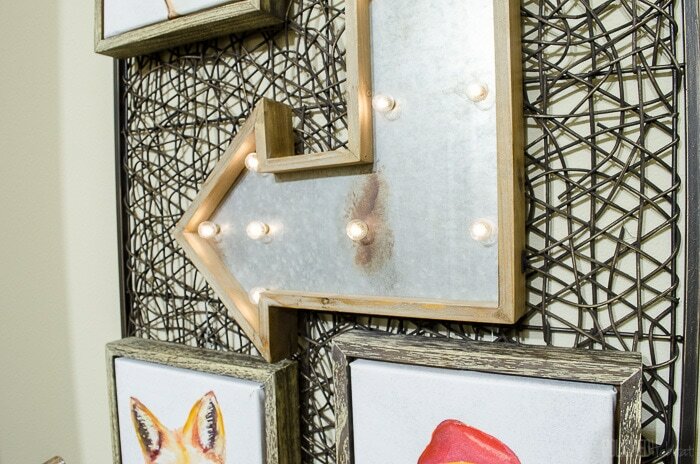 You’ll also want to make sure your art is either in the studs or anchored properly. Safety first! 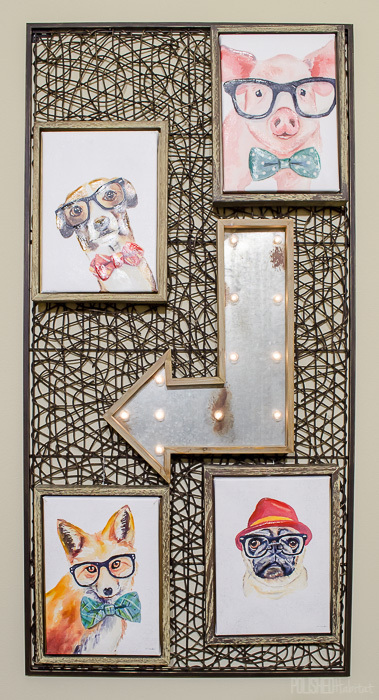 With the arrow attached, there was just enough room to add four canvases of animals in glasses. Because, why NOT have a gallery of adorable animals in glasses? If you are a cat person, there is a coordinating Super Cat version that ALMOST converted me into a cat lover. 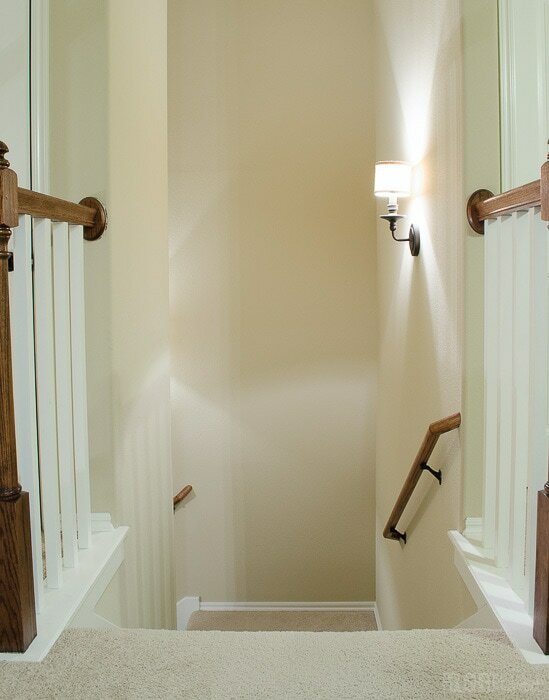 I just love how much more “finished” the house feels when I go up and down the stairs now. Since the wall is so tall, It seems like it would still have felt undone if it was ONLY the metal art or ONLY the smaller pieces hanging directly on the wall. The layering gives the area more presence. Now it’s your turn. Pier 1 is providing a $150 gift card for one lucky winner. Visit Pier1.com to find something you’d love, and then enter below or by clicking “A Rafflecopter Giveaway” if you are on your phone or tablet. Oh, I LOVE Pier 1. It is so hard to choose just one thing! I always walk in there and want to buy it all. I think, however, I’d go with an outdoor papasan chair! We have a lovely screen porch in desperate need of some more seating! I’d definitely use it towards the Carmichael Buffet. I’ve been looking for a piece just like that for my kitchen. I love clocks and am having a hard time deciding which one I want. I love the Juliet Wall Clock and the Galvanized Metal Paris Clock. I really need a nice end table and a great reading lamp!